these recordings document a 5 hour improvised performance from the second annual soundwalk even in long beach california, august 20, 2005. the text below was my initial proposal to the event organizers. although video is mentioned as a possibility, i ended up focusing on sound alone. on the evening of the event, the audience entered the space to find few old rugs covering the dance floor, and a couple of small lamps with low watt bulbs. from my windowless little cardboard shelter hidden in a corner, i had no idea what was going on in the space; and most of the visitors assumed they were listening to a pre-recorded installation. since the piece was playing through speakers located roughly 10 feet above the audience and reflecting off a dome ceiling back down to the listeners below, i would not recommend headphone listening, but giving the sound some distance. after seeing the dome room, thinking my ears off, i've decided what i would like to do. something i've thought about for awhile - that really suits the opportunity of the soundwalk situation. basically i want to do a durational performance as an installation. i will be in the space somewhat off to the side and probably inside a little tent of some sort so not visible, and will darken the room ("pay no attention to the man behind the curtain"). i would also possibly like to have a scrim hanging around half the circle with some video projected on it (although not clear yet on this and what it would be) the audio would come from 4 medium size speakers on the floor or on pedestals facing up at the dome to reflect off of it. pillows or suggestion of floor sitting for visitors on the dancefloor beneath the dome, with perhaps some lighting there as well. 1. the relationship to audience and the hope that the viewers/listeners would find a way to detach themselves from ME, and simply focus on the sound. to have the experience be non-narrative, no beginning or end in terms of crescendo, and to make the space comfortable for people to sit for awhile, walk away, return, have a coffee, return, etc. 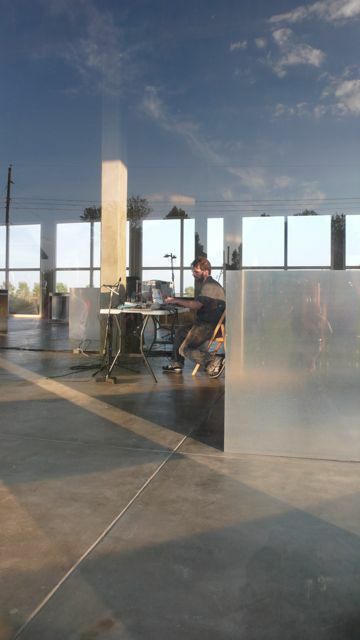 to create a sound space or installation where the sound is being made live, but the focus has nothing to do with the performer (i'm thinking of erik satie walking around telling people not to pay attention to the performance while it is happening). i would really like for people to feel comfortable staying in the space for short bursts, and thus will try to place myself in a way that doesn't suggest PERFORMANCE.